GDPR has now come into effect and it’s likely that most businesses are still trying to understand their legal responsibilities. Unfortunately, for many, GDPR has been a guessing game which means many are leaving preparations until the last possible minute. This applies to many legal firms too, with the focus for most being around marketing preferences as opposed to data held on clients and even staff. So, if you are yet to get your GDPR responsibilities fully in order, fret not. If you’re still to understand what GDPR means for your business, then have a read of our previous blog, otherwise read on to discover how law firms can ensure they are GDPR compliant throughout the practice. The first thing to consider is the data you hold on your clients. This extends to the information you hold on your employees too. Most importantly, consider what form these are held in and how easy it is to retrieve that information. Don’t forget about any duplicate copies and back-ups and you might have too! One of the most significant impacts GDPR is going to have on law firms, is individuals having the power to access what information an organisation holds on them and the right to be forgotten. 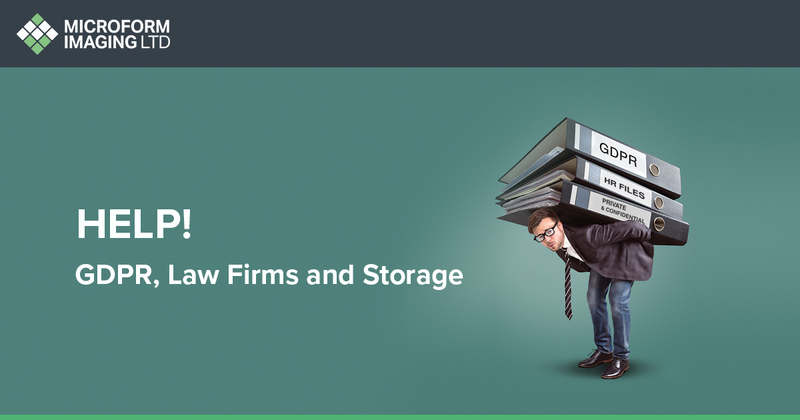 Considering the nature of information law firms might hold, it’s highly likely that this profession is one that is likely to receive the highest requests which could have a significant impact on the smooth running of a law practice and its profitability. Under the new regulations, in most cases, you cannot charge a fee to comply with a subject access request, and you must act on the request within one month of receipt. Therefore, serious consideration needs to be made as to how easy it will be for your law firm to identify all the information you host, how easy it is to compile and the cost impact that might have to your firm. While digital data can be secured and retrieved the most effectively, there is no getting away from the fact that most legal professionals hold a variety of paper records on their clients. Safe storage of these documents is of the utmost importance while in use to ensure that you have secure labelling and robust tracking of documentation in place. Can you digitise your documents? Once cases are complete, files often go into storage or may be destroyed. Before you undertake this process consider what the best approach might be, especially if you may need to refer to these files again in the future. Digitising your documents enables you to securely store all paper-based documentation which enables you to access swiftly and easily should you need to refer to these files at any point in the future. Why should you digitise your documents? How can Microform assist your law firm during the process? Microform has experience working with a vast range of industries, the majority of whom host highly confidential documents and private records. Because of this, Microform ensure processes are strict and secure to ensure complete protection for clients. Before undertaking any project, we work with you to identify your requirements and how best to process the documentation and if necessary, destruction of paper-based documents. We utilise Microform staff and vehicles to collect and deliver documents ensuring the information is transported in the most secure manner. We do not rely on external carriers for this process. Our staff also have to go through security screening such as DBS security checks and are provided with enhanced training which extends to all manual handling procedures. Working with a variety of clients with complex security and confidentiality needs, Microform offers some of the highest levels of security within their premises. Sites are protected by state-of-the-art security which is monitored by an external security company; we can offer cages to further add additional layers of security and only permitted staff are allowed to access certain areas. Once documents are digitised, they are encrypted throughout the upload transfer process using a TLS (Transport Layered Security) protocol and stored securely on our servers, which are accredited with ISEO 27001 and are protected further by next-generation Sophos Security, providing a gateway protection service and intrusion prevention system. You may, during the digitisation process choose to securely destroy paper-based records and documentation. If this is a service you require, we work with Go Shred, our partners in secure document disposal. Go Shred destroy all records and documents on our premises in a specially designed vehicle which meets compliance with the European Shredding standard EN15713. Once complete they are baled and sent off for recycling at the end of the process. A Certificate of Destruction is provided to confirm this activity has taken place. If you are a law firm looking to digitise your paper-based records, then contact us today to discuss how Microform can assist your law practice in becoming GDPR compliant. Previous Article Does document scanning help security?